BMW is set to launch its first hybrid model next year with the introduction of the ActiveHybrid5 - a petrol-electric version of the 5 Series. 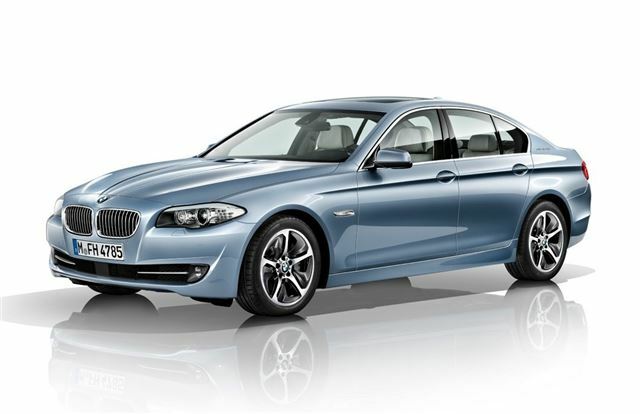 On sale from February 2012 and priced at £46,860, BMW says the new model delivers performance similar to that of the 535i but with far lower fuel consumption and CO2 emissions. It's powered by a 3.0-litre twin turbo engine with 306PS (the same engine that's used in the 535i) along with an electric motor that develops 54PS and an eight-speed automatic gearbox. Combined, the engine and electric motor produce a total of 340PS and 450Nm of torque. The ActiveHybrid 5 can travel for yp to 2.4 miles on electric power - at speeds up to 37mph - supplied by the high-performance lithium-ion battery stored in the boot. The electric motor, also integrated into the gearbox housing for the best packaging efficiency, delivers a maximum 210Nm of torque from rest, so performance from a standstill should be impressive. Standard equipment on the ActiveHybrid 5 includes the BMW Professional Multimedia satellite navigation system, an eight-speed automatic transmission, four-zone climate control, 17-inch alloy wheels, black panel display and high-gloss Fineline Anthracite wood interior trim. On the outside the car is distinguished by chrome slats on the grille, door sill strips and on an aluminium plate on the centre console. It also gets matt chrome tailpipes.